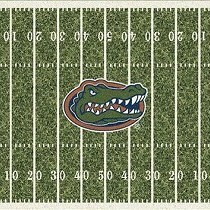 Milliken NCAA Sports Rugs | Floors, Flooring, Carpet and More! College football is in season and fans are into their teams more than ever! Which NCAA Football Team do you think is going to take it to the championships this year? The Alabama Crimson Tide certainly looks to be a contender but how about Clemson and them Georgia Bulldogs? Whomever you root for, do not wait until the season is over to upgrade your Man-cave, She-shed, office or bedroom with Millken NCAA Sports Rugs for the die- hard football fans in your life! Millken NCAA Sports Rugs are available in several different styles and sizes to fit your sport fan’s taste. Sports Team Rugs that proudly display the team logo or mascot (aka spirit rugs), rugs that repeat the logo in a fashionable pattern (aka team repeat rug), or even as the playing field! Get your game on! 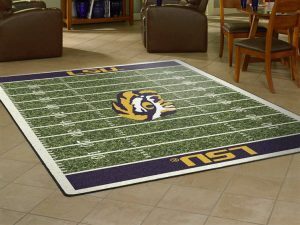 Find your team and get the best deal on licensed NCAA college team rugs from Milliken only at American Carpet Wholesalers! These Millken NCAA Sports Rugs are proudly made in the USA! They come in a variety of available sizes with the smallest being a 32″x46″ and the largest being 10’9″x13’2″. Do you own or have you ever thought of owning a sports themed restaurant or other establishment? These rugs would look great on the floor or hanging up as part of the decor. And with all the different sizes and styles available you can really add some variety to where your clientele is enjoying the game! Millken NCAA Sports Rugs are made from 100% nylon pile fiber with Milliguard stain protection and have a 5 year limited warranty. So get your athlete or super fan their favorite team rug, and make that room into their home field, court, or arena with Milliken Sports Team Rugs. These rugs are ideal for pool rooms, home theaters, man-caves, she-sheds, kids rooms, rec rooms, or even the bedroom. Give American Carpet Wholesalers flooring experts a call at 1-800-548-2706 to get your own Millken NCAA Sports Rugs!